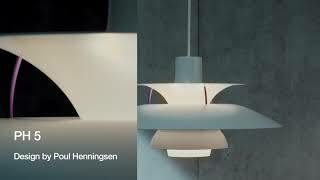 PH Snowball Suspension, designed by Poul Henningsen. The key features of the PH Snowball Suspension - 8 shades mounted on 3 legs, the top of the shade is glossy, creating sparkling light, the underside is matte, avoiding reflections. The geometry of the PH Snowball Suspension ensures that all the illuminated surfaces of the shades are hit by light rays at the same angle, creating optimum, even lighting performance. The PH Snowball Suspension is considered a smaller version of the PH Louvre, but the number of shades is reduced to just 8 mounted on 3 legs - and the diameter of the fixture is also reduced due to the fact that it was intended for lower ceiling spaces.